In 2014 the Ukrainian Heritage Statue Committee was formed with Rosann Wowchuk chosen as Chair. Members included Len Derkach, Shirley Novalkowski, Melisa Stefaniw and Eric Irwin as well as other active members of the Ukrainian community around the province. They started raising funds with various events and simply by asking interested people from around the province to donate towards this appropriate project for the 2016 celebrating of 125 Years of Ukrainian Immigration to Canada. 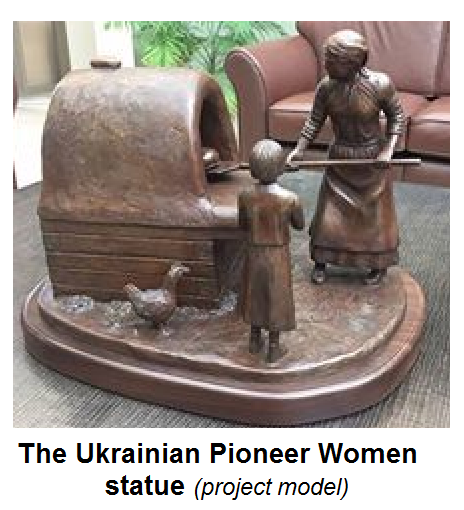 The vision was to erect a statue in the heart of the City of Dauphin to honour the determined ‘pioneer woman’ and all the spirit of faith and perseverance that she embodied and all that she contributed to the successful settlement of thousands of Ukrainian families in the early years. Ukrainian immigrants came to western Manitoba and had next to nothing and often found themselves in the middle of a thick bushland with no one but their Lord and their family to depend on. The woman of the family…. The wife and mother – in a way that only a determined woman could - somehow made things happen while the husband tried to clear the bush and work out a living in dire circumstances. The Provincial Government of Manitoba designated a considerable amount of funding toward the project with the understanding that members of the community would strive to match the funds. Many individuals donated toward the project with the understanding that donations of $500 or more would be recognized on a commemorative plaque at the statue site. The Shevchenko Foundation, the Winnipeg Foundation and the City of Dauphin were among the first more major donors. The City of Dauphin was chosen because of it being western Manitoba’s hub of Ukrainian cultural and social activity for many decades. Canada’s famous National Ukrainian Festival occurs in Dauphin annually. 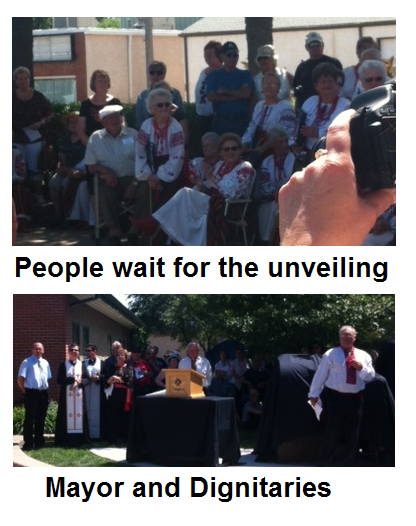 In fact, the unveiling of the statue coincided with the first day of this year’s Festival. 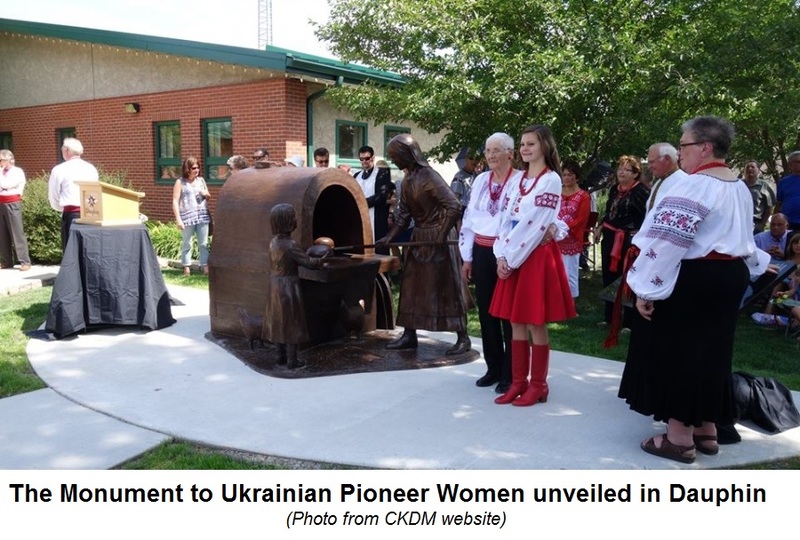 The day of the unveiling the of impressive monument to Canada’s Ukrainian Pioneer Women which is entitled ‘Perseverance’ took place on Friday 29 July 2016 at 2:00 PM. Fulfilling the role of Master of Ceremonies was Dauphin’s Mayor Eric Irwin. As the initial funding was provided by the civil government it was very appropriate that greetings were read by two members of the Province of Manitoba’s Legislative Assembly and a Member of federal Parliament. Brad Michaleski the Conservative MLA for Dauphin, and Flor Marcelino the NDP MLA for Logan spoke as did the Conservative MP for Dauphin-Swan River-Neepawa, Robert Sopuck. The Project Committee Chair Rosann Wowchuk gave a history of the project and its great significance for the local population and all Canadians. 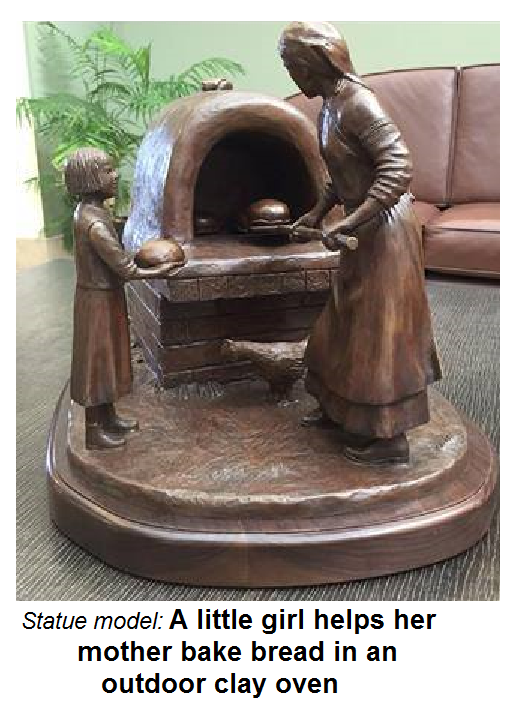 The actual statue was unveiled by Mrs. Mary Sichewski of the nearby village of Horod and Kristen Boychuk from Cowan. The commemorative plaque was proudly unveiled by the Mayor of Dauphin, Eric Irwin. A prayer and blessing was conducted by some of the clergy from the area: The Very Rev. Fr. Oleg Bodnarski, the Ukrainian Catholic Dean of Dauphin, Father Brent Kuzyk, the Pastor of the Ukrainian Orthodox Parish in Dauphin and Father Mykhaylo Khomitskyy, the Ukrainian Catholic Pastor of Dauphin, Russell and district. The unveiling ceremony was concluded with a majestic rendition of the Ukrainian Anthem performed by Choir of Canada’s National Ukrainian Festival.